Spyderco Caly3 C113GGY in Super Blue Steel Sprint Run- Grand pa knife is going high tech. “Yasuki Hagane steel has been produced in their plant in Shimane prefecture in Japan where the high quality iron sand has been produced for making traditional Japanese swords since ancient times. These are three main premium grade high carbon steels (Shirogami, Aogami and Aogami Super) that have been used for making Japanese made field & kitchen knives. Hitachi metal is also known as the manufacture of high grade premium stainless steel, ATS-34 and ZDP-189.Blue Steel is made by adding chromium and tungsten to Shirogami (White Steel) that makes the material more durable and provides corrosion resistance and mostly used for making high-grade Hocho (kitchen knives) and outdoor knives. I’ve never been interested in the Calypso. Call me names but the lock was “old”. Not the smoothest operating tool… as all lockbaks. But the Calypso and all its offsprings got a common feature: ergonomy. A thin blade (not wide for a Spyderco after all) in a light and pointy package. The years (decade) go by. The Caly 1.5 turns into a test platform for the Aogami Super with a first Sprint Run. I was very excited when Jur has shown me that absolutely beautiful folder. But alas to much vertical play for me and that, made me step back. This is the problem with all back locks but with my Caracara chinese made G10 first generation. 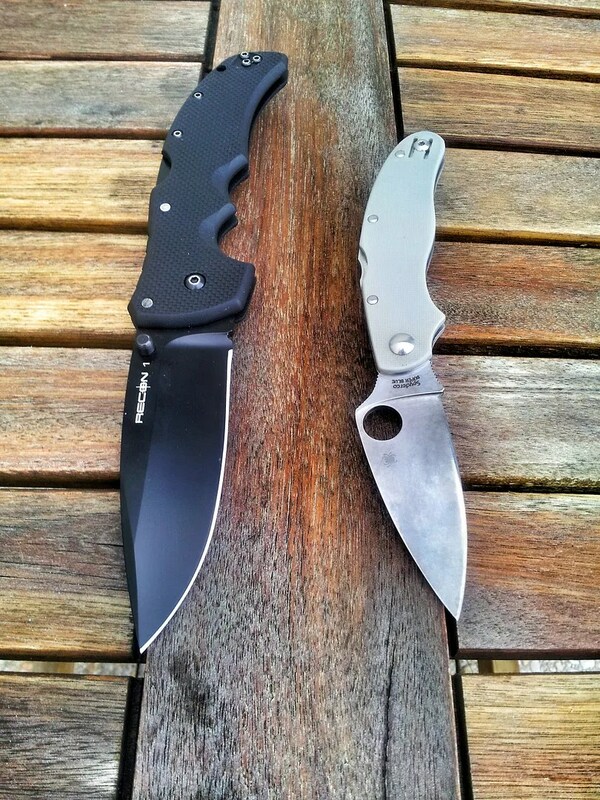 I remember falling in love with the first XL Cold Steel Clip Point Voyager… vertical Play. 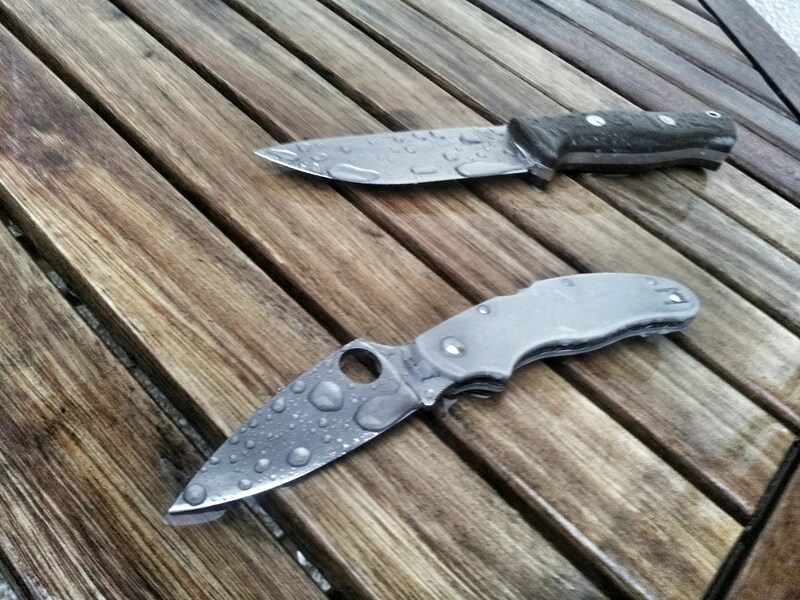 Massad Ayoob first Spyderco folder… vertical play. The Mighty Chinook , first and second generation ? Vertical play. Oh you can live with that. But I do not like a tool which got moving parts in the palm of my hand when I’m cutting something hard. The Caly3 in Super Blue Steel got vertical play but much less than the Caly 3.5 I had tested. Now the Cold Steel Triadlock is curing that “disease”. That’s why they are so pleasant to use and so reliable to chocks like Fred Perrin has shown us by throwing his mini Lawman repetitively (more than a 1000 throws!) without any failure or even any vertical play. Vertical Play is a curse. I remember Michael Janich’s “Street Steel” book explaining why to go away from any lateral or vertical play in a folder knife. And I believe every single words Mr Janich is writing. Common sense is more precious than adamantium nowadays. Ok my Caly3 vertical play is minor. And on a short knife with ergos like a boot knife this is not a major problem. I mean if the lock should ever fail (and that vertical play on locks has been noticed on very very strong backlocks) my precious fingers would be protected by the quillons on the blade: when you are holding a Spyderco folding knife, you are holding it mostly by the blade. Giving all strength and all structure stress directly to the blade not “through” a fragile channel: the pivoting handle. The C36 Military was the first to offer that “boot knife” feature. Holding the knife by the blade is something as ancient as the Roman folding knives you can find in archaeological fields. In the ancient times, the handle was considered merely as a sheath not something to hold your tool… So folding knives were used as hand razor: by holding the blade. So about the Caly3, this means that I don’t “feel” any important play when I cut on a board for example. This is mandatory for me to trust a folding knife and sticking to short fixed blade for EDC (as you perharps know I love short fixed blade, Ian Grenier’ FIne Urban Cancelled Knife, Fred Perrin’s Lagriffe, my Izulas, My Newt Livesay NRG, my wonderful Fred Perrin / Spyderco Streetbeat and my great BRKT Bravo1… (chich is not that small after all). Ok, the Caly is sheeple friendly. It got a thin, short, not threatening blade and this Sprint Run got also a grey G10 handle and a stainless steel back spacer. It doesn’t scream “TACTICAL KNIFE!! 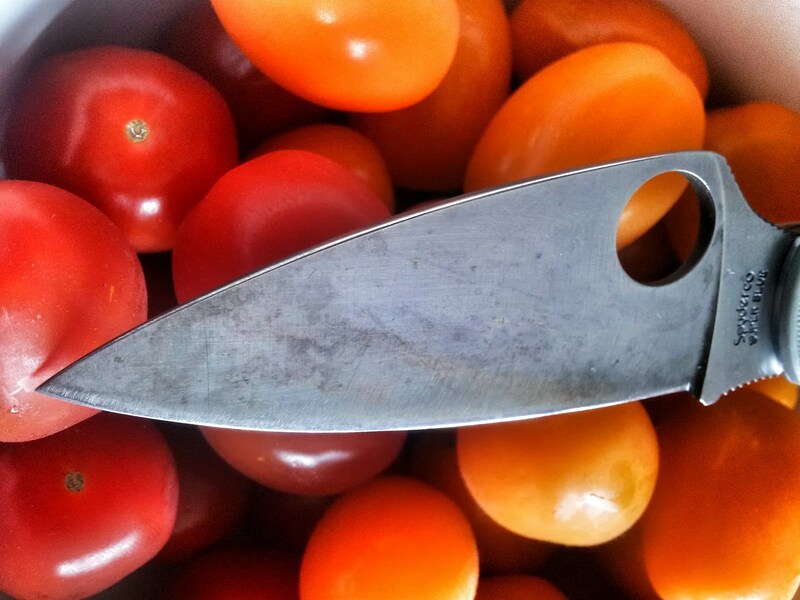 !” like the mighty Cold Steel Recon 1 XL CLip Point… So I can use it in the plate in a restaurant. nobody notice it and it makes the difference as a matter separator. 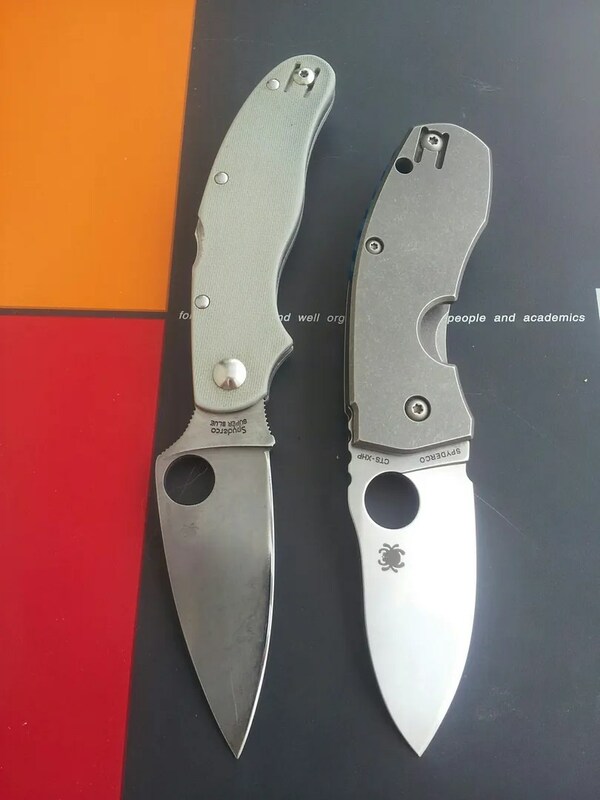 The Sprint Run of C113 got a non stainless steel blade. This is something to experiment. I love my 1075 and 1095 and my M2 blades to get stain. A patina is a must IMHO. It gives character and low profile to a bad reputation tool. 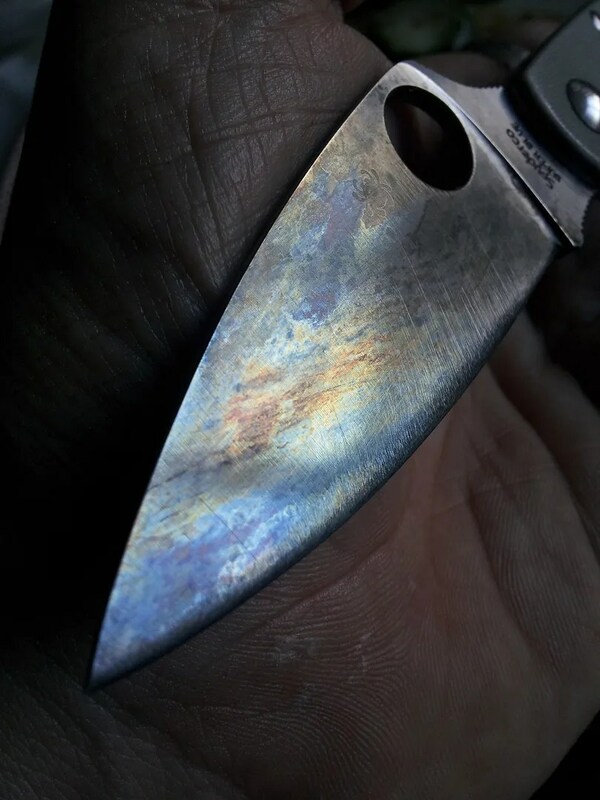 I first enjoy patina on my 1095 Schrade Sharpfinger almost 20 years ago… The blade feels “natural” to react to oxygen and acids… It gives “beautility” to a very personnal tool. So what to not love in the Caly3 ? Even closed that folder featuring Sal signature is radiating honesty and confidence. I remember reading an article about a man saving his baby boy from a mountain lion attack with a Spyderco Caly 1.5 knife. This means confidence in your tool. My Caly3 is reliable. I can trust it when I need it to cut deep and fast. And I can trust it to get stains in warp speed too. No surprise there. Like an Opinel in carbon steel you know how to clean and oil it to keep it far from rust. The Caly is pointy. Much more than a Techno. It got almost more edge length than a Native. Ho, there is something I love: the bulging pivot screw on this sprint run. The pivot screws is falling perfectly under your thumb when cutting horizontally. About ergos the knife is held in full grip like a much bigger knife. On the handle, there is place for four fingers even without involving the choil. The Caly3 is not a all screw construction and …. I don’t mind. I got no plan to dismount it. I have cleaned it by rinsing it under hot water tap. It so far so good. Now about Super Blue. I have re-profiled the blade as I was expecting much better sharpness. no the edge is thin and convexed but still… I got a much better sharpness feeling with my AUS8A blades (Cold Steel Voyagers, Recon1 and Code4) or the CPMS3V on my BRKT Bravo 1…. I need more mileage on Super Blue Steel to crown it. So far it could be 1075, I don’t feel the difference. Posted on 21/06/2013 31/10/2017 Author nemosandmanCategories Folders, PhotosTags AUS8A, Backlocks, Bravo1, BRKT, Caly3, COde4, Cold Steel, Fifty Shades of Grey, Hocho, khaleesi, Michael Janich, Recon1, Sal Glesser, Sharpfinger, Shimane, Shirogami, Soyderco, Super blue steel, Swords, Vertical Play, Wireclip3 Comments on Spyderco Caly3 C113GGY in Super Blue Steel Sprint Run- Grand pa knife is going high tech.